1.) Captain Roland Ward Jones and Elizabeth ("Lizzie") Clouston, the two main characters in With This Pledge, are people who really lived. And With This Pledge is their love story. 2.) The Battle of Franklin is a real battle that took place in the final days of the Civil War—on November 30, 1864 in the small town (at the time) of Franklin, Tennessee, some 20 miles south of Nashville. 3.) 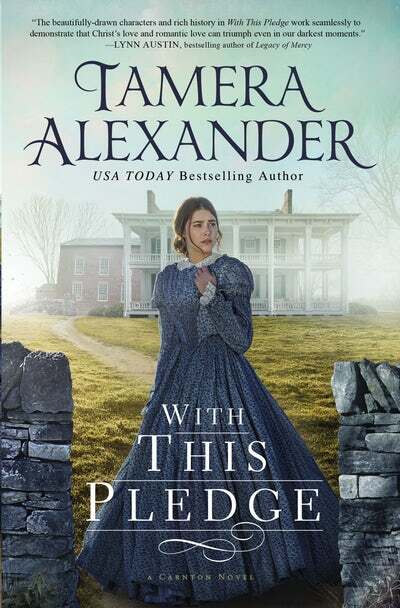 Tempy, a secondary character in With This Pledge and Christmas at Carnton—and the McGavock’s cook and house slave—is based on the real woman who served in the McGavock household the majority of her life. 4.) Nearly 10,000 men were either killed, wounded or captured during the five-hour Battle of Franklin. 5.) All of the letters in the novel (with two exceptions noted in the Author’s Note) are real letters (and love letters) from people who truly lived. 6.) The recipes in the back of the novel are all wonderful, tried-and-true Southern recipes just waiting for you to try! I really want to read this book. I have loved reading Tamera for a long time. I love the extra stuff so interesting. I love Tamaras writing. This one sounds amazing as well. Thanks for the chance. Thanx for being part of the tour! Looking forward to reading this book! Loved reading the excerpt. I miss the days when handwritten letters were crucial to keeping in touch. I love the historical details in this author's books! With This Pledge sounds like an epic story! Thank you for sharing. Love that there are recipes in the book. That makes it so charming.